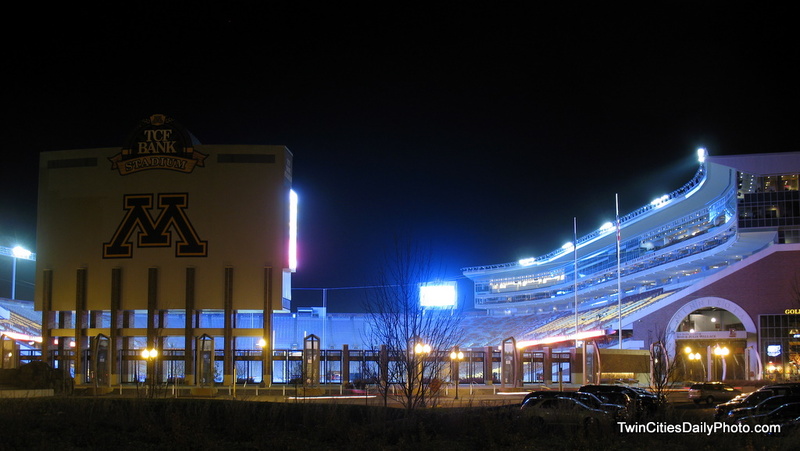 I finally made it over to the University Of Minnesota to see the new TCF Bank Stadium at night. Minnesota Gopher football returns to campus after twenty plus years of playing football games in the Metrodome, several miles off campus. My visit was brief as I was there to see the Gopher Basketball game. I didn't have a tripod with me, but made do with what I could find nearby for this nighttime capture. The stadium is quite impressive and was larger than I expected it to be. The football team was having a practice, so some of the lights were on, just enough for this photo.